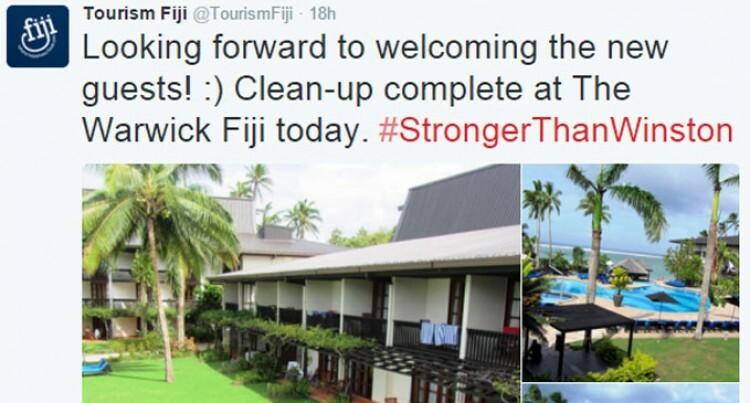 A Tweet from Tourism Fiji. Attorney-General Aiyaz Sayed-Khaiyum has urged tourists who had planned their vacations in Fiji to continue with their plans and not to be discouraged by Tropical Cyclone Winston. “The best way our friends in Australia and New Zealand and other countries can help us apart from the aid that they are giving us – is to keep visiting Fiji,” Mr Sayed-Khaiyum said. He said major tourism destinations in the country were spared the wrath of TC Winston and a few,which did sustain damages, will be up and running within a week. Denarau Island properties are all open for tourists and Fiji Airways has also resumed all its normal flights. Speaking at a press conference yesterday, Mr Sayed-Khaiyum said the tourism industry could assist Fiji to quickly recover from TC Winston. “The tourism industry is very, very critical to the Fijian economy and it contributes about 35 per cent to our GDP (Gross Domestic Product) and we are lucky in the sense that majority of the resorts in Fiji are operational. “Majority of the resorts in Fiji received some superficial damage, some received damage that can be fixed up within a week or so. “Denarau is operational and other resorts in the Western Division are operational. One or two resorts in the Mamanucas have been affected- the Tokoriki Sheraton and resorts in Vanua Levu- around Savusavu and Taveuni area have been affected, but the others are operational. TC Winston will have an impact on the economy. Government, he said, was looking at various policy measures at this stage. Prior to Cyclone Winston hitting our shore, the International Monetary Fund had released a report on Fiji in which had forecasted very good growth rates for Fiji. It also praised policies of Government for setting a very solid foundation in terms of a good economy base for now and the future.